Texas athletics doesn't take on many junior college athletes, and Gordon is the first for the track and field program since Melanie Walker in 2005-06. The Longhorns are ranked fifth nationally for women's and men's. Both teams are looking to defend Big 12 titles this week at TCU. Over the years, Texas athletics has generally steered clear of junior college transfers. For one, credit hours can be incompatible. Two, coaches see grooming an athlete for four years as a better investment than two. Yet exceptions are made for special talents, such as track and field star Chrisann Gordon, who heads into this weekend’s Big 12 championships at TCU with major point-scoring potential. Backed by Gordon and several other premier runners, fifth-ranked Texas is viewed as a slim favorite over ninth-ranked Kansas State. The Longhorns are hoping to defend the title they won a year ago at Iowa State. UT’s men, ranked fifth and also looking to repeat, will get pressure from eighth-ranked Texas Tech. 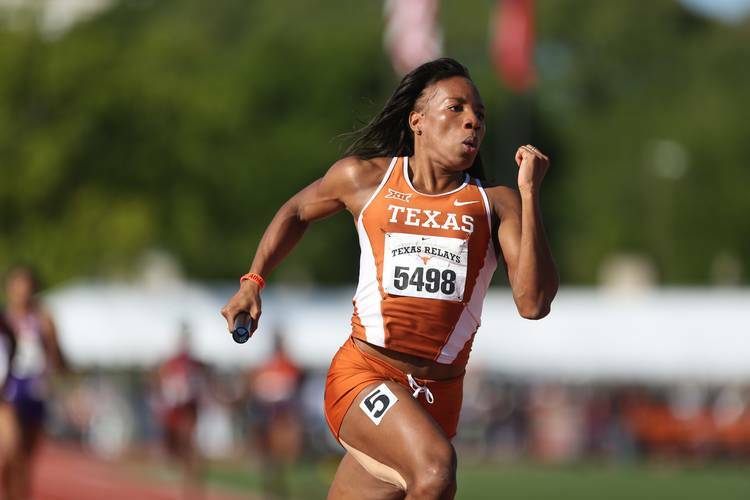 In her first season with the Longhorns, Gordon, a two-time 400-meter junior college national champion, has been everything the coaching staff thought it was getting when she approached them about transferring from South Plains College in West Texas. With a time of 51.03 seconds that she recorded in her first crack in the 400 last month at LSU, Gordon checks in at fourth in the NCAA and fifth all-time at Texas. Her emergence gives the Longhorns a stiff 1-2 punch in the event with top-ranked Courtney Okolo, the collegiate record-holder. Additionally, Gordon runs the lead leg on the second-ranked 1600 relay and also will chip in this weekend in the open 200 and the 400 relay. University of Texas junior Chrisann Gordon runs in the 4×400 meter relay at the Texas Relays on April 2, 2016. Taking the path of junior college should not be viewed as an indictment on Gordon’s academic strength. In fact, the education major does pretty well in the classroom and is on pace to graduate a year from now. However, attending high school in the Jamaican parish of St. Ann, Gordon said she never had designs of coming to the United States for college — and in turn never bothered to take the SAT. Once she reconsidered, it was too late to apply for the test, so amid limited options she headed off to Levelland and South Plains College, whose track and field program has dominated the junior college ranks for years. There, Gordon twice won the 400 national title and helped her team to three NJCAA titles — two outdoor, one indoor. Last year, she was honored as the nation’s athlete of the year for indoor and outdoor. Among junior college transfers, Gordon is the track and field team’s first of note since Melanie Walker in 2005-06. Walker, of Essex County College in Newark, NJ, contributed on three NCAA championship relays for the Longhorns. UT’s football team currently has three JUCO transfers — tight end Blake Whiteley, offensive lineman Tristan Nickelson and defensive lineman Quincy Vasser. Augie Garrido’s baseball team doesn’t have any, nor does Shaka Smart’s basketball team. In women’s basketball, UT announced Audrey-Ann Caron-Goudreau, the nation’s top power forward, as part of its last recruiting class. When selecting her next stop after South Plains College, Gordon researched the success of Texas’ 400 runners and said she arrived at an easy decision. Gordon owns something that none of her UT teammates can claim — a gold medal from the senior world championships. In last year’s preliminaries in Beijing, she ran the third leg on Jamaica’s 1600 relay, which qualified second. However, she was replaced in the finals and Jamaica won gold, edging the United States — and former Longhorn Sanya Richards-Ross — by 31 tenths of a second. Next month, weeks after she could be representing Texas at the NCAA championships in Eugene, Ore., Gordon will travel to Jamaica for the Olympic trials.